My 2006 Trip to Pennsylvania. I was going East to take a couple of classes (related to work.) They were both one week classes (and only about 20 miles from each other) so I had a free weekend. It was to be spent in Valley Forge (about 5 miles from my first hotel) and Philadelphia. It's not my fault Hershey, PA was right in my way. I only did about 550 miles on Day 1, in part because I left later in the morning, and part because I wanted to get to Hershey when Hershey World was open. Just because. I stopped at a Comfort Inn in Somerset, PA. It was only when I looked through the local tourist propaganda that I found I was only 10 or 15 miles from the Flight 93 site. So I got up early the morning of October 15, and followed the roundabout directions to get to the site, and took some pictures. I have no pictures of Hershey World. It was packed and all I took was video. But I suspect I picked up a virus here (you're right, it might not have been from some sniffling little kid that was in every corner of the place, but that's my story and I'm sticking to it) that kept me sick for the next three weeks. 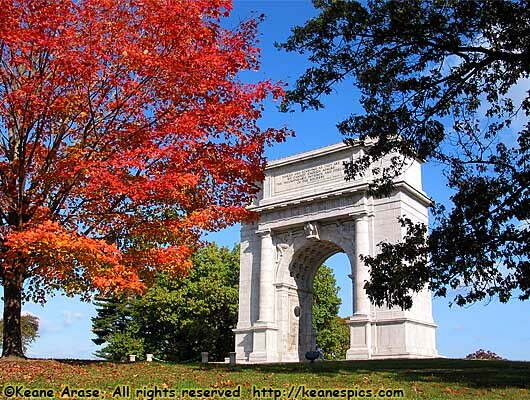 The National Memorial Arch, Valley Forge National Historical Park. Saturday was Valley Forge Day. I could do it by myself in my car, I even had a self-guiding tour on CD. I was barely able to sit through a introduction movie in the Visitors center. Unlike the day I came for some planning information, today is bright and sunny, if not a little chilly. I get to the National Memorial Arch, and laugh when I see all the Masonic symbols all around. National Treasure anyone? The interior walls of the arch is the seal of the United States, the Eagle with shield and the unfinished pyramid with the all-seeing eye, and they somehow belong here. This is where the Revolutionary Armies wintered in 1777-78, after all. I visited a place that George Washington actually slept at. I didn't have much time to spend in Philadelphia in 2001. I had reservations to get to in Central Florida. I was on a time-table. So this time, I planned an entire Sunday in Independence Park. Much to my disappointment some things were closed, but most of the things I wanted to see were open and accessible. I had to pass through a metal detector to get into The Pennsylvania State House (aka Independence Hall) but once in, you had the run of the place. I didn't see Independence Hall last time, but I did this time. The last time I saw the Liberty Bell, but not this time. It was crowded, and my coughing fits would have gotten me thrown out of the place. The Franklin Museum was empty though, and that was a joy since Ben is one of my favorite historical figures. As a post note, this trip to Philadelphia could be considered another part of my Lewis & Clark trek across the country. Meriwether Lewis left Philadelphia on his 10,000 mile journey in mid-1803, in a time when the fastest one could travel was on a horse; in a time the average person didn't travel more than 20 miles from their home; in a time when people thought if you exceeded 50 miles per hour, you would die. Three months prior to my trip, I visited many Lewis & Clark sites, from Fort Mandan in North Dakota to Fort Clatsop in Oregon. (See my 2006 West Vacation for details and pictures.) While it's true that The Corps of Discovery's start and end point was officially St. Louis, Philadelphia was Lewis' starting point, where he was schooled by the best minds of the time on what to expect, and where most of the planning for the trip occurred. It took Lewis 3 years to travel from Philadelphia to Fort Clatsop and back to St. Louis, where the Corps Of Discovery's trip officially began and ended. I accomplished it in three months, and that was with a 2 month layover. Lewis did a lot more sightseeing, though.